Well, I was too bloody lazy to get my camera at 6:00 this morning (when I awoke, walked into the bathroom to turn off my alarm, then went back to bed until 7:15), too busy engaging in my self-imposed urgency to document getting ready, and then the rest was relatively tedious and/or embarrassing, so here instead are some pics from Friday's fun. Our posh choice for the evening. Yes. Candied bacon on chocolate torte. alright, ok. but the chocolate bacon torte? nuh-uh. the salad cocktail, also no. Wow!! We SO need one of those here - how fabulous! 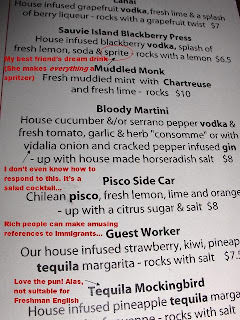 Love the name, love the drink pics, love the menu discriptions, your friends are very pretty, but totally baffled by the bacon.... Did you eat it? PS if I don't get a Tequila Mockingbird sometime soon I might hurt someone. That bacon dessert looks weird. I'm not game. I was about to protest because that was not our shared night, at all. But then I remembered that we hit the first happy hour and split out early. I love people who are open to trying new things! Candied bacon is amazing!!! You put my Friday night to shame... drinks AND bacon...Heaven. So wait... You have your alarm clock in the bathroom!??! I'm a little taken aback at the Guest Worker. Hmmm. Vidalia? I can see it. A good vidalia or a 10-15 from South Texas can be as sweet as an apple...delish! Chocolate. and bacon? no thanks...just give me the chocolate!! Looks like a great evening!! Ha chocolate covered bacon. I am trying to imagine what that would taste like. Did you like it? You lost me at the bacon. Though the rest of the dessert looks amazing!